Fake ‘Nazi atrocity’ photographs are exposed by this leading German revisionist. Case studies of how ‘war crimes’ are manufactured. Shows how photographs have been faked to ‘prove’ the Holocaust. Many photographs, printed on high quality gloss paper. 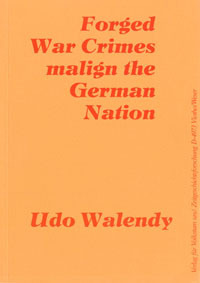 'Forged War Crimes' by Udo Walendy, P/B, 80pp.